I am two with nature, professes Woody Allen, and this New Yorker is only too happy to corroborate his math. I know nothing about the flora that roots itself in the city’s spaces, and with my gaze locked in perceptual auto-filter, I hardly see them at all. The only branch I’ve noticed lately is the one that belongs to my bank. Courtesy of none other than New York’s tree census. After saving it all as a text file and pasting it into a new workbook sheet, feeding the names into a text-to-columns grinder and mashing the columnized names via a concatenating ampersand or two (e.g. =B3&” “&C3&” “&D3&” “&E3), I nailed and glued the whole goopy effluvium into a tottering VLOOKUP table that seems to be standing up to New York’s December gusts and showers. After next inundating the sheet’s next available column (which I titled Species Name) with lookup formulas that exchanged the codes for the full species names, and paved the formulas over with a copy Paste Special > Values hard-coded surface, the deed was done. 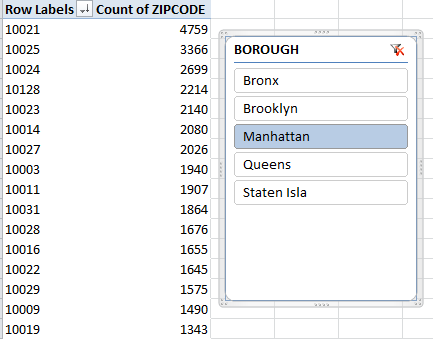 You’ll find some inter-borough comparisons across the same species that place the Manhattan diameters on the low side. A few final points: As could be anticipated with a 623,000-record data set, some distinctly outsized numbers appear to have crept into the park. The 148-32 86th Avenue address in Queens’ Jamaica neighborhood boasts a 2100-inch-diametered tree, and my Google Maps photo just doesn’t capture it. At 175 or so feet in width, I think it would show up.